Jabiru Safari Lodge is located within the Mareeba Tropical Savanna and Wetland Reserve, an hour and 15 minutes drive west of Cairns, on the northern edge of the Atherton Tablelands (Cairns Highlands). The 2000ha reserve of open savanna woodland, grassland, and freshwater wetlands provides a unique setting for the Jabiru Safari Lodge, allowing guests to fully appreciate the outback savanna environment and prolific birdlife during the best times of the day. The Jabiru Safari Lodge is a comfortable nature experience and has been designed to ensure you can experience the wildlife to its best advantage. Your Lodge Host and Reserve Guide will make you welcome and be happy to assist to make your stay memorable and rewarding. 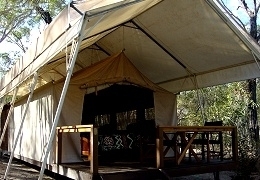 The unique, safari-style tent-cabins blend into the open savanna woodland providing comfortable overnight accommodation. Delightfully furnished with high quality private en-suite facilities, insect screens, a fridge and a fan, it utilises natural materials which compliment the warm tones of the safari furniture. To cool off or relax after your days activities, a heated spa tub is located near the deluxe safari cabins in a rustic bush setting. Accommodation is in three deluxe en-suite African-style safari cabins and 2 en-suite eco-cabins. Each safari cabins appointed with comfortable beds and linen. The safari cabins are spacious and light with shaded private timber veranda with BBQs and comfortable tables and chairs, perfect for bird watching reading and enjoying the sights, sounds and scents of the Australian tropical savanna. Enjoy a glass of champagne as the sun sets over Clancy's Lagoon. "Outback with a touch of class!".. Twin Share Deluxe Safari tent-cabin includes complimentary continental breakfast on the Lagoon Deck, conservation pass and 12 months membership of the Wildlife Conservancy of Tropical Queensland. BBQ packs or dinner on the lagoon deck are available at an extra cost, bookings are essential. 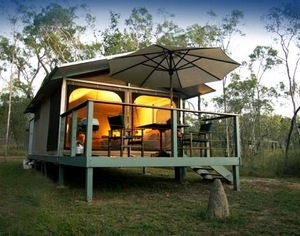 Single use Deluxe Safari tent-cabin includes complimentary continental breakfast on the Lagoon Deck, conservation pass and 12 months membership of the Wildlife Conservancy of Tropical Queensland. BBQ on deck for self catering. BBQ packs or dinner on lagoon deck available at extra cost, bookings essential. Twin Share Eco Safari tent-cabin includes complimentary continental breakfast on the Lagoon Deck, conservation pass and 12 months membership of the Wildlife Conservancy of Tropical Queensland. BBQ on deck for self catering, BBQ packs or lagoon deck dinner available at extra cost, bookings essential. Single use Eco Safari tent-cabin includes complimentary continental breakfast on the Lagoon Deck, conservation pass and 12 months membership of the Wildlife Conservancy of Tropical Queensland. BBQ on deck for self catering, BBQ packs or lagoon deck dinner available at extra cost, bookings essential. The Jabiru Safari Lodge is located within the Mareeba Wetland Reserve and the reserve opens at 9.00am and closes at 4.30pm. If your arrival is after this time arrangements will be made for late access, please contact the visitor centre on 1800 788 755 for information. 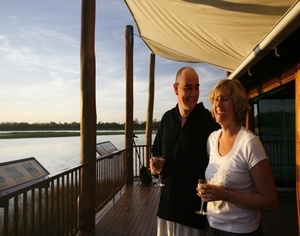 The Jabiru Safari Lodge closes during the wet season (Feb - March). Following the wet season, the Lodge re-opens in April as soon as conditions allow. Please check for details by contacting us at the Visitor Centre. Children are welcome and are half adult price. Each safari tent can sleep 3 adults, or 2 adults and 1 child or 2 adults and 2 children ( one child on a folding bed ). Please contact the lodge direct for prices for extra guests. Car parking available at the safari tents. Jabiru Safari Lodge is located within the Mareeba Tropical Savanna and Wetland Reserve, an hour west of Cairns, on the northern edge of the Atherton Tablelands (Cairns Highlands). The Reserve is 6.5kms north of the township of Mareeba an easy 1 hour drive NW of Cairns, or 1 hour SW of Port Douglas with a clearly signposted turn-off on the highway at Biboohra. is in the Clancy's Lagoon Visitor Centre, open from 9.00am daily. the township of Biboohra where you will take a left turn opposite the Biboohra store and service station into Pickford Road. From Port Douglas If you are travelling from the north (Cape York, Port Douglas) heading towards Mareeba, Pickford Road will be on your right. Road Conditions Pickford Road is a gravel road suitable for conventional vehicles. It is a total of 7km from the Biboohra turnoff to the Visitor Centre - 4km to the Reserve entry gate, and a further 3km to the Visitor Centre & Jabiru Safari Lodge reception. All directions are clearly signposted, and there is ample car parking at the Visitor Centre. Our custom-designed, open safari vehicle allows excellent wildlife and bird life viewing as we tour the Reserve at a leisurely pace. Kangaroos, wallabies, wallaroos, emus and wild pigs are regularly sighted, along with many of the 220 bird species sighted on the Reserve. 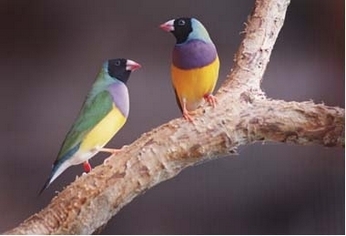 The highlight of any wildlife safari is Pandanus Lagoon and its prolific bird life viewed from our Bird-hides. Enjoy the afternoon eco-cruise by quiet battery-powered boat on Clancy's Lagoon then travel in our custom-designed, open safari vehicle into the heart of the 2000 hectare Reserve for wildlife viewing, bird watching and some billy tea at Pandanus Lagoon. Cap off a wonderful day by enjoying wine and cheese while the sun sets over the picturesque lagoon. 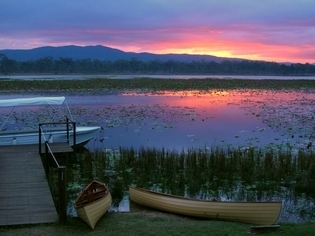 Enjoy the early morning delights of the Mareeba Wetlands with a morning guided tour departing at 700am. We drive in our custom-designed, open safari vehicle through the Reserve spotting up to 30 different bird species along the way to Pandanus Lagoon. Departing at 11.30 am you travel by our open safari vehicle, specially-designed for wildlife viewing through the Reserve to Balancing Lagoon with wildlife spotting en-route. We stop for a snack and a swim at Douglas Cascades returning to the Lodge by 1.30pm. Take a leisurely paddle around Clancy's Lagoon at your own pace in a locally-made handcrafted wooden canoe. Explore the Savanna and wetlands environment at your leisure with over 12km of marked walking trails.